Leeds United fans can watch every midweek Championship fixture this season on Sky Sports. The broadcaster has introduced a new feature which starts on Tuesday night allowing Leeds fans to see every minute of action from the eight midweek rounds this season. The service comes at no extra cost. Leeds fans will be able to watch all midweek games on Sky Sports. Sky Sports are showing Leeds United's trip to Swansea City on Tuesday and Aston Villa v Brentford on Wednesday with all other fixtures available behind the red button with full commentary or on the Sky Sports app with the Sky iD log-in. 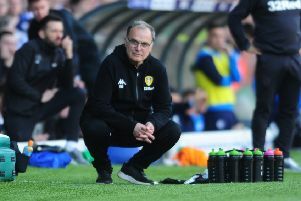 Fans will be able to watch Marcelo Bielsa's men on the red button when they welcome Preston North End to Elland Road on 18 September and when the team travel to face Hull City and play Ipswich Town at home the following month. Fans unable to access Sky Sports can watch midweek matches via iFollow if their club has opted into the the new streaming service the Football League has launched following the deal between Sky and the EFL in the UK. Leeds, however, do not offer the option for fans based in the UK and Ireland.